The ability to distinguish foreign microorganisms from host cells is crucial to avoid detrimental localised damage to self during an inflammatory response. However, there is a rare set of chronic diseases where immune cells begin to target and damage host cells and tissues. When adaptive cells break self-tolerance, the resulting condition is characterised as Autoimmunity, where native host cells are recognised as foreign and the adaptive immune cells target them for destruction. 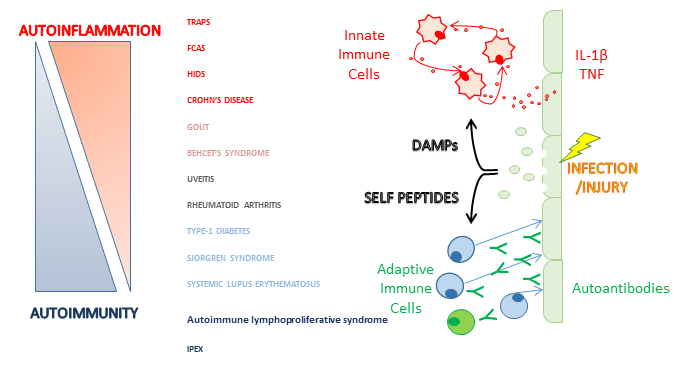 When innate immune cells become activated, due to dysregulated secretion of pro-inflammatory cytokines and consequent damage to host tissues, it is termed Autoinflammation (Figure 1). Figure 1: The Autoinflammation/Autoimmunity spectrum of diseases and their immune mechanisms. TRAPS: TNF receptor associated periodic syndrome, FCAS: Familial cold autoinflammatory syndrome, HIDS: Hyperimmunoglobulinemia D syndrome, IPEX: immunodysregulation polyendocrinopathy enteropathy X-linked syndrome. The concept of autoinflammatory disease was introduced to distinguish a set of inflammatory autosomal-dominant diseases from self-directed autoimmune diseases. These genetic conditions were previously classed as autoimmune but do not have adaptive immune cell involvement, and so the term autoinflammatory was coined. The immunopathogenesis of autoinflammatory diseases involves disruption in crucial pro-inflammatory cytokine pathways, such as tumour necrosis factor (TNF) or Interleukin-1β (IL-1β). The underlying mutation in TRAPS is located within the TNF1 receptor gene, causing the pathway to become constitutively active. IL-1β secretion is dependent on the NLRP3 inflammasome, an intracellular adaptor-protein complex, to cleave pro-IL-1β into its active form. In conditions such as FCAS, there is an underlying mutation in the NLRP3 gene, causing high levels of active IL-1β and IL-18 to be cleaved and secreted. These mutations in innate immune cells, such as monocytes and neutrophils, lead to systemically elevated levels of pro-inflammatory cytokines, thereby creating a positive feedback loop of exacerbating inflammation. Thanks to the elucidation and classification of these conditions, scientists have developed immunotherapies to reduce the amount of circulating TNF and IL-1β. These drugs, such as etanercept and anakinra, respectively, are able to bind to and sequester these cytokines. Blockade of aberrantly secreted cytokines alleviates the systemic inflammatory symptoms that individuals with autoinflammatory syndromes have to endure, such as fever, rashes, abdominal pains, conjunctivitis and sensitivity to cold (FCAS).